Story: When the anti-grannies killed the first Rai in 3216, Grandmother needed a new warrior. She approached the homeless warrior Sho Sugino who accepted the role as the new Rai as a way to obtain a better destiny. 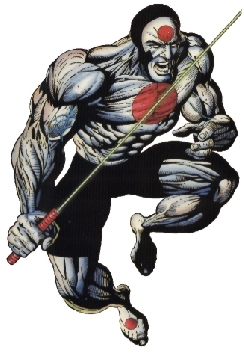 After a year as Rai, Sho was asked to retrieve the 'Blood of Heroes' which was the nanites from Bloodshot's blood. Rai accepted and was send to 'the Lost Land' where he retrieved the blood by killing its protector. Upon the return to the rendezvous point, Grandmother told him that he was not an acceptable Rai and she needed a Rai from a lineage bred from the purpose. She could not bear to kill him and therefore left him stranded in 'the Lost Land' instead . After several years in 'the Lost Land', Rai was approached by Erica Pierce who persuaded him to join her cause. Seeing this as an opportunity to get revenge, he joined Erica Pierce' cause . What happened to Sho Sugino after this has not been revealed. Skills & abilities: Enhanced strength and durability. The infused energy also allows him to create weapons by focusing the energy.